“No question about it…this was a homerun,” said Michael Dixon, CEO and President at UNeMed, the event’s primary host. The inaugural MidWest Drug Development Conference pulled together a dozen Midwestern universities, which represented more than $4.6 billion in research expenditures and 1,787 new inventions in 2016, according to the most recent data available. Those 12 universities presented 41 new, drug-related technologies in short, 10-minutes packages. The audience was a collection of pharmaceutical executives, venture capital groups and other potential partners who could help further develop those new technologies. The goal of the Midwest Drug Development conference is to provide industry and investors a single event to learn about cutting edge Midwestern therapeutic technologies and start-up companies. 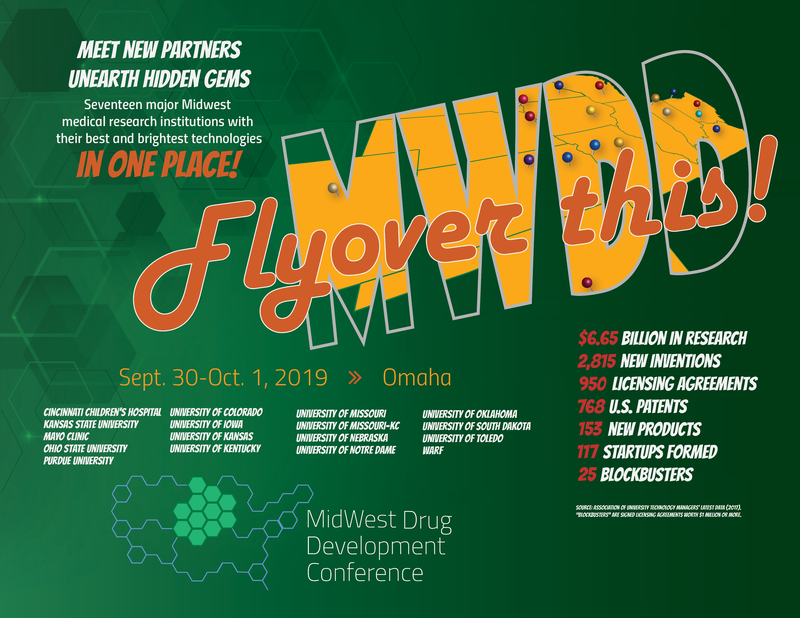 The 2019 MWDD conference will offer feature technologies from most major Midwestern universities, including Nebraska and the Nebraska Medical Center, Kansas, Kansas State, Iowa, Iowa State, Iowa, Mayo Clinic, Note Dame, Kentucky, Cincinnati Children’s, Missouri, Oklahoma, Purdue and Colorado. Ample spaces dedicated to networking will be available for university, industry and investor guests who want to engage in one-on-one partnering discussions regarding their technologies. List is tentative, and subject to change at any time. Researchers at Purdue University have identified compounds with potent antibacterial activities. Vancomycin-resistant enterococcus (VRE) is a leading cause of hospital-acquired infections in the U.S.
Bacteriocins, antimicrobial peptides produced by certain bacteria, exhibit significant potency against other bacteria, including antibiotic-resistant strains. Lymphoma immunotherapy can result in durable immune and clinical responses. Diabetes mellitus (DM) impairs the healing of fractures and there is a need for improved therapeutics to stimulate bone regeneration in diabetic patients. Natural killer cells suppress the magnitude and quality of vaccine responses. A new family of fast-acting and quickly reversible boron based neuromuscular blockers can enable tracheal intubation and maintain muscle paralysis during surgery. New drugs help treat multiple myeloma and other types of cancer by targeting a protein called geranylgeranyl diphosphate synthase, also known as GGDPS. Structural modification of a non-selective aminocyclohexanol-based heat shock protein 90 KDa (Hsp90) inhibitor led to a highly selective inhibitor of glucose regulated protein 94 kDa (Grp94). Novel KOR antagonists can be developed as a therapeutic treatment for mental conditions such as depression and anxiety related disorders. Researchers at Purdue University have developed a new liposomal formulation of combinational antibiotics for the treatment of respiratory infections. SalvePed is developing ND-336 for the treatment of diabetic foot ulcers. Certus Therapeutics provide a novel nanoparticle drug delivery platform (Lypos) for cancer chemotherapies with enhanced tumor-targeting properties. Cincinnati Children’s has developed novel small molecule inhibitors that target both IRAK1/4 and mutant FLT3, thereby eradicating leukemic cells. An extracted form of purified crocetinic acid from saffron has demonstrated significant anti-tumor activity against pancreatic cancer cells in a mouse model with low toxicity. This novel analog targets the COX/LOX pathways for relief of pain and inflammation, without the negative side-effects of typical COX-2 inhibitors (GI, renal, cardiovascular), especially with chronic administration. The development of Ewing Sarcoma therapeutics revolves around the natural product anticancer agent mithramycin (MTM), which was recently shown to be a potent inhibitor of Ewing sarcoma cells in culture and mice, by disrupting the activity of the aberrant transcription factor EWS-FLI1. Novel cardioprotective vasodilator peptides with enhanced affinity for AM and CGRP receptors have been developed. CartilaGen’s technology is an intra-articular injection of drug suspended in a hydrogel vehicle. Novel inhibitors of nicotinamide phosphoribosyltransferase (NAMPT) can treat cancer, and also has potential in other NAMPT-related conditions like Alzheimer’s disease, diabetes and arthritis. Cincinnati Children’s investigators have generated several potent non-toxic small molecules that directly bind to a specific Rac activator and inhibit Rac signaling in vitro and in vivo. Mayo Clinic researchers have developed a small molecule inhibitor of Cyclophilin B (CypB) and PIKfyve kinase for use in treating a variety of cancers, including lymphoblastic leukemia and lymphoma. Mayo Clinic researchers have developed a fibrin-based hydrogel that can support an induced pluripotent stem cell (iPSC) derived retinal pigment epithelial (RPE) monolayer during differentiation but can be degraded in a matter of hours “on demand”. Though incurable, multiple myeloma is treatable and the current treatments include steroids, chemotherapy, covalent proteasome inhibitors, immunomodulatory drugs, and stem cells transplants. UK researchers have discovered a novel pyrazole scaffold compound that targets the active site of proteasomes. Mayo Clinic researchers have developed a novel technology to define new repertoires of tumor antigen(s) which work alone or in combination to generate anti-tumor immune responses. A full hour of networking along with a complimentary breakfast. 10 a.m. — 11 a.m.
11 a.m. — 11:40 a.m.
A complimentary cocktail mixer for networking. Guests are responsible for their own meals. As the first-ever Midwest Drug Development Conference winds down, please take a moment to help us learn where we went wrong, where we went right and how to improve the event for next year, or even if the event is worth repeating. It’s only 10 questions and should only take about four minutes. À la carte options are also available, such as meal sponsorships and advertising placements. Contact Michael Dixon to learn more. Learn more about how you can help bring academic research to the marketplace!